Like it or not, social media has become powerful enough to either ensure a business’s success or destroy it. I recently read a survey of over 300 executives conducted in 2014 by Forbes Insights. It revealed that 88 percent of them are focusing on “reputation risk”. If you aren’t familiar with the term, you should be. Reputation risk is the risk of loss–typically revenue–resulting from damage to a firm’s reputation. World Economics attributes 25 percent of a company’s market value to reputation. As a result, companies are putting more focus on responding to reputation challenges. New and old reputation risks are evolving with technology, including social media and online review sites. It’s important to remember that, while the Internet was released to the public in 1991, it didn’t really become mainstream until 1999. Coincidentally, it was in 1999 that three websites (RateItAll, Deja, and Epinions) set in motion a trend for online reviews that catapulted businesses into an age of transparency where reputations spread faster than ever. Gone are the days where sharing a person’s experience with a business is limited to the number of people they know or have contact with. The impact of word-of-mouth is exponentially larger with online communities. Technology now allows individuals to share their experience(s) with hundreds, thousands, even potentially millions of people online. It stands to reason that the larger the company, the more customers it has. More customers equal a much larger collective voice. That’s great if your company does all the right things and has satisfied customers preaching the benefits of using your company over another. Unfortunately, that’s not typically human nature. Dissatisfied customers have always been more vocal, and social media now affords each customer a giant megaphone to voice an opinion to a much, much larger audience. And if that’s not bad enough – it doesn’t go away. It stays in cyberspace forever, and every search of a company’s name brings the bad review to new eyes. Negative reviews, like bad pennies, pop up again and again to haunt a business. I’ve heard the argument that some companies possess less than 1 percent market share, so reputation doesn’t have THAT big of an impact on sales, right? It’s not quite that simple. Let’s do some math and break it down to see just how much of an impact that 1% can have online. One percent market share of a city with a population of let’s say 9 million is 90,000. According to Statista.com, 78 percent of the U.S. population has a media profile, so that would give you 70,200 social media users in your 1 percent share. Realizing that the average Facebook user has 338 friends, that 1 percent market share now has the potential to reach 23,727,600 people with their views on your company. That’s almost 24 million people! Let that sink in for a moment. Obviously, you don’t expect the entire 1 percent of your market share to post comments online about your company, but research has shown that 24 percent of people write reviews online and a whopping 88 percent of consumers trust online reviews before making a buying decision. Twenty-four percent of 70,200 social media users = 16,848 people leaving reviews reaching 338 friends each (not including review portal sites) = 5,694,624 total people reached with their comment. 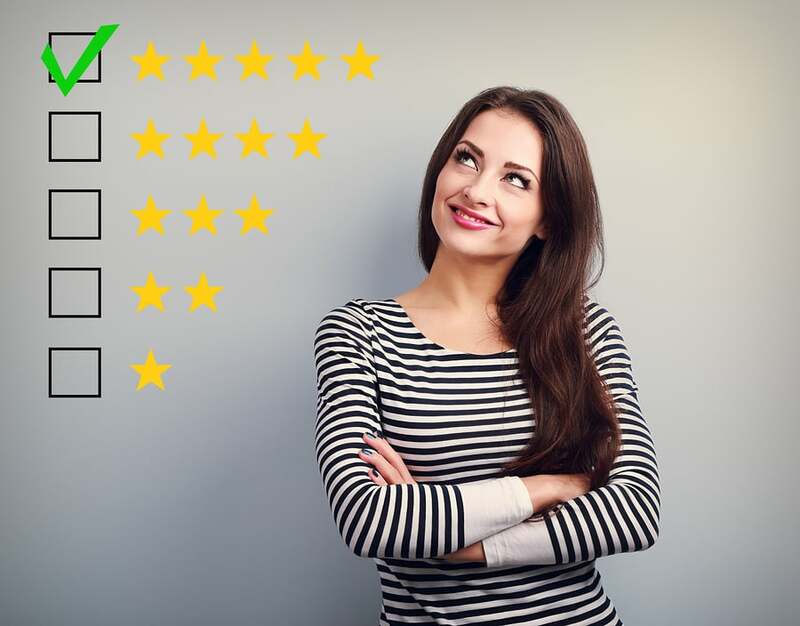 Because we know that 88 percent of those people trust online reviews, that means a total of 5,011,269 people in your market are seeing and believing those reviews. If your company has less than a 3-star rating, those numbers can get scary in a hurry, so it’s easy to see how much of an impact reputation can have on your bottom line; that’s your reputation risk. If 5 million people are seeing your bad reviews, your advertising, no matter how good, CANNOT make up for that. Your sales opportunities WILL be fewer. Your sales revenue WILL decline. And while you’re scratching your head trying to figure out why sales are in a downward spiral, your competitors with higher online ratings WILL be gaining on YOUR market share. Identify the common thread. If the majority of people have the same complaint, then that is the area you need to change. It’s that simple. Don’t ignore it. Don’t over-complicate the issue. Focus on the solution. Now that you have focused on the real issue at hand, discuss ways to provide what your audience is asking for. You must address the need or the issue will never go away. Be accountable. Stop making excuses. Refer to items (1) and (2). Engage with your audience. Let them know you aren’t perfect and that you are aware of their concerns and are working on improving. Don’t be afraid to be public about it. It shows you are human and they are not dealing with a machine. People want to do business with humans. Your business and reputation will improve.